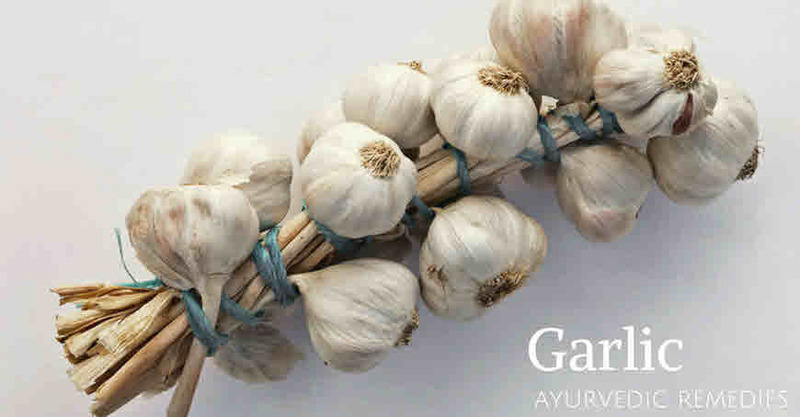 Learn about Garlic botanical description, medicinal properties, medicinal uses in Ayurveda, Garlic for treating Hair loss, Garlic Uses for Cardiac Health. Most important is that it removes toxins, revitalise the blood, stimulate blood circulation, improves digestion, removes mucous, and is good for healthy heart. Garlic is used all over world as a condiment and home medicine for centuries. Garlic offers innumerable health benefits as it is good for cardiovascular health, lowers cholesterol and blood sugar level, and is useful in several other ailments. Garlic has got its medicinal properties due to the presence of at least thirty-three sulfur compounds, several enzymes, seventeen amino acids, and minerals. Sulfur compounds give garlic its pungent taste and specific odour. It is also very effective in hair loss. Oil prepared from Garlic has antiseptic, antimicrobial, antibacterial and anti-parasitic activities. It can be safely applied to the body areas affected with ring worm. This oil can be applied topically to the skin diseases that are caused due to bacteria, fungal or yeast. Origin and Distribution: Believed to have originated in Central Asia;Used in ancient India, China, Egypt, Greece and Rome;Cultivated throughout India;also in Pakistan, Bangladesh and almost in all tropical countries. Hardy perennial bulbous scapigerous herb;stem flat, dry, lower portion of the plant forms bulb which consists of several smaller bulbs called cloves, surrounded by a thin white or pinkish sheath;leaves flat, narrow green;heads bear small white flowers and bulbils. Soil required for cultivation: Rich, well-drained, moderately clayey loam, requires a cool, moist period during growth and a relatively dry period during maturing of the crop;4-5 months required to mature and harvesting during February to April. Volatile Oil containing Allyl Disulphide and Diallyl Disulphide. It also contains Allin, Allicin, Mucilage and Albumin. Garlic is known as Rasona in Sanskrit which means the one which lacks only one taste. Garlic is used both internally and externally. Oral intake of garlic has good effect on the whole body. The clove of garlic has alterative (restores health), antibiotic, anti-fungal, aphrodisiac, carminative (prevents and expels gas), diaphoretic (sweat causing), diuretic (stimulating urine), expectorant, hypoglycemic (sugar lowering), hypotensive (blood pressure lowering) properties. Garlic cloves exhibits activity against many types of bacterial diseases. Its oral intake prevents blood platelet aggregation. It is beneficial to eat garlic in many diseases such as high blood pressure, high cholesterol, arterosclerosis (deposition of fatty material on their inner walls), asthma, cold, cough, loose motions, diabetes and parasitic infestation. Garlic is also used externally. It can be prepared as a bolus to treat yeast infection or an enema to treat dysentery. Uncut clove can be used as a suppository to treat haemorrhoids. Garlic cloves boiled in sesame oil are used as ear drops for treating ear pain. This medicated oil is also used as wash to treat gangrenous wounds and snakebite. Garlic powder is prepared from dried cloves. The process is, cloves are dehydrated to remove the moisture and powdered. The powder has the same chemical composition and pharmacological activity except it does not have the allicin, the pungent principle. Eating raw garlic causes garlic breath. In such case chewing some cardamom/ealichi or fennel/saunf is helpful. You may also try one drop of pure peppermint oil in a cup of water. Garlic has good effect on cardiovascular health. Rasona ksheer pak or Lahsun Ksheer Pak is used traditionally for the heart diseases. Nowadays, garlic capsules are available that can be taken in a dose of 2-3 capsules. A powder prepared from garlic, hing, cumin/jeerak, rock salt, sendha salt, shunti, pippali, and maricha/black pepper in equal proportions, is given in doses of about twenty grains, every morning with a decoction of the root of the castor oil plant, in facial paralysis, hemiplegia, sciatica, paraplegia, and convulsive affections. In Sandhivata or osteoarthritis, three gram paste of garlic twice a day should be taken with sesame oil. Inn ear-ache and pus in ear, about three garlic cloves are boiled in three tablespoons of til oil cooled and three drops are put in the ear. In cold, cough, excess mucous three cloves are boiled in cup of water. This is taken twice a day. Simply chewing few garlic cloves is also helpful. For asthma three cloves of garlic boiled in milk, can be used every night. In weak digestion a paste of about five garlic cloves, 2 green chillies and little salt is fried in 3 teaspoon of til oil and is taken for seven days. Crushed garlic cloves infused in water or milk is useful in all types of digestive disorders. Use of garlic is beneficial in colitis, dysentery and many other intestinal upsets. In mild diarrhea and dysentery, one garlic capsule taken three times a day cures the condition. In syphilitic skin diseases, garlic paste is rubbed externally. In cold sore, skin diseases, chopped garlic cloves are put in vegetable oil/olive oil for a few days. This is applied externally on sores for 2-3 times a day. In wounds, abscesses, boils, infected wounds, externally use garlic paste. Garlic is a rejuvenator. It removes toxins, revitalise the blood, stimulate blood circulation, improves digestion, removes mucous, and is good for the whole body. It should be eaten daily. You may chop the cloves and mix them in food. You may also make a tasty chutney of garlic cloves with mint/coriander leaves or simply chop 3 cloves and take with water. Garlic is very good herb for treating Hair loss. Rubbing garlic pods improves blood circulation and stimulates hair regrowth on skull. For treating alopecia or bald patches with garlic, take its clove and remove peel. Crush it and rub this pulp on the affected area. Rubbing improves blood circulation and stimulates hair regrowth. You can apply this twice a day, in morning and evening. Do this regularly for a few months as this treatment takes time to show result. Garlic contain sulfur compounds that help cardiovascular system by Preventing oxidative damage of blood vessels. This has been clinically proven that garlic is very good for overall Cardio health. Preventing unwanted contraction of our blood vessels that causes rise in blood pressure. Unwanted inflammation of blood vassals. Due to sulfur content H2s forms inside that causes dilation of blood vessels and thus reduces blood pressure. For this there is a preparation called “Lahsun Ksheer Pak” which is very good for improving heart problems. Boil them in 1/2 cup water and a 1/2 cup milk. When it reduces to half then filter it and drink. Garlic can be used in many forms. It can be used as fresh raw cloves, powder, and oil. How to make Garlic Oil at Home? There are two methods to prepare garlic oil, steam distillation and infusing garlic in some vegetable oil such as olive oil. For preparing garlic oil at home infusion methods is used. 1) In this method, the cloves are crushed and put in glass container with olive oil or some other vegetable oil. This is left for some time and then cloves are filtered and garlic oil is obtained. 2) Heat any vegetable oil like mustard or sesame oil and add some chopped garlic cloves and cook it on low flame for 15-30 minutes. Let it cool down and filter it. Your Garlic oil is ready for use. If you want to prepare it for massage you can also add some carom seeds with garlic. In India traditionally it is used as massage oil to get rid from aches due to cold. Garlic oil has antiseptic, antimicrobial, antibacterial and anti-parasitic activities. It can be safely applied to the body areas affected with ring worm. This oil can be applied topically to the skin diseases that are caused due to bacteria, fungal or yeast. It is also used for treating scalp infection. In the case of dandruff or some bacterial scalp infection its application helps to cure the same. Garlic oil can be used for scalp massaging. Traditionally, it is used as ear drop to cure earache. In such cases few drops of garlic oil is put in ear. Add crushed garlic cloves in this boiling water. Steep for ten minutes. You may steep it even for a few hours. If you want to prepare allicin and allicin derivative rich tea then crush garlic cloves and leave it for an hour and then use these cloves to prepare tea. Use this tea for gargling if suffering from sore throat. Garlic tea has all nutritional, health and medicinal benefits of raw garlic. It has no known side effects. Garlic powder is produced from garlic cloves. First garlic cloves are dried to remove moisture and then grinded to make garlic powder. This powder is given tablet form for oral administration. 1-2 tablets (300 mg – 600 mg) twice a day with meals can be taken. When taken in excess amount, longer duration garlic may produce some side-effects. It can irritate stomach and kidneys. It may cause a burning sensation in the mouth or stomach, heartburn, gas, nausea, vomiting and body odour. Garlic is a blood thinner and it slows blood clotting. Precaution should be taken while taking blood thinning medicines. It should not be taken in large amounts during pregnancy and breastfeeding as it may cause digestive distress. In some sensitive people, even small amount of garlic can cause allergic reaction or upset stomach. Garlic can irritate the gastrointestinal tract. It should be used cautiously in stomach or digestion problems. Garlic reduces blood pressure. So people with low blood pressure should use it cautiously. Topical application on skin, might cause damage to the skin, similar to a burn.